When babies are born, people are compelled to offer advice. Whether or not its sought, or even welcome, it comes to new parents at lightening speed. If she falls asleep too early, wake her up or you’ll both be up all night! No matter what, you never, ever, ever wake a sleeping baby. Don’t ever deny a cry for hunger! Feed on demand. It’s so important to maintain a schedule. Feed her every hour and a half without deviation. After a while, we become numb to the advice and start to tune it out, realizing that we have to find our own paths with our own children. But every once in while, something sticks. When Brooke was born, I was thrilled. I desperately wanted a second child for so many reasons, not least of which was that I’d grown up an only child yearning for a sibling. But I was also nervous. Katie and I were inseparable. I worried that she would feel slighted by the diversion of my attention. I don’t remember who said it. The words floated in on the sleepless haze of Brooke’s infancy. But they came back to me time and again. Perhaps it was the talk of babying Brooke that reminded me of all of this. Perhaps it brought back the memories from when she really was a baby, and just how different things were then. And how, in some ways, they’re not so different at all. We have twisted and turned and contorted ourselves over the years to make Katie feel special. To show her how much she means to all of us. We’ve celebrated Katie Days and gone to great lengths to carve out time just for her. But it’s not enough. Or maybe it is enough, but not of the right thing. She has told me that she loves our time together. She has told us time and again how much it means to her. But she also tells me that she feels like WHEN WE ARE ALL TOGETHER, she always comes second. And although the former is nice, it doesn’t help to change the latter. She still feels like when the sh-t hits the fan, we’re scampering off to help Brooke and she’s on her own to fend for herself. So after nine and half years, I’m back to where I started. The other day, Katie and I were talking. Brooke wanted my attention. She didn’t NEED it; she WANTED it. She was not in distress. Nothing was wrong. She simply had a question. Brooke’s questions tend to get answered quickly. Over the years, it appears, we made a subconscious decision to address them with a sense of urgency. We knew that if we didn’t hear and acknowledge her quickly enough, she’d get anxious. And her anxiety level can – and does – dramatically affect the entire family. So over time, we decided to let her interrupt us. We taught her to do it politely, which she does. Sometimes. It was the path of least resistance. It felt safer than risking the alternative. It may also have been a self-fulfilling prophecy. Either way, her sister noticed. Brooke’s needs, even the smallest of them, were addressed before her own. It took more work – and in the end, more time out of our conversation (and yes, more attention) – not to answer her question immediately than it would have to just answer it and move on. But I think it mattered. There are so many times when we simply don’t have a choice but to stop everything and cater to her. But it’s time to pause and think before assuming that they are all those times. They’re not. Yes, it took more work – and in the end, more attention – not to answer her question immediately than it would have to just answer it and move on. But now I know it mattered. A HUGE thank you to our veterans today and every day. We are so grateful for your service to our nation, to us. As I’ve said so many times before, you’re a great Mama! I love that pic (! ), and the advice, which you passed along to me shortly after Ainsley was born. I’ve done it with Cymbie, and on her own level, I think she gets it. So thank you for that. It’s so hard to find the balance. You’re a good Mama. Juggling 2 (esp when one is SN) is so much harder than I ever imagined. Great job! She’s old enough to wait a minute or two(it sounds like). We do the same. Especially at dinner. Everyone needs to learn not to be rude. First of all, I love how your Momma is always the first to offer support and loving words after each post. I can see that a tradition of love and respect is being passed down from generation to generation in your family. My own daughter is 6 years younger than her brother on the spectrum, and she has had to come second too many times. It’s hard for her to understand at 6 years old. It does become habit, and it isn’ fair to her. It also robs my son of the opportunity to stretch his patience and turn taking muscles. Thank you for the reminder. My youngest Aspie with ADHD has this issue in spades. She CANNOT “not” interrupt. Definitely a meltdown trigger if we delay listening to her. For many years,her interruptions were a major trigger for my husband’s anger and frustration. (He is on the spectrum, too, and he cannot stand to be interrupted. Sigh.) We didn’t know what was up with her until this last year. We knew that something was different, but we did not have a diagnosis. It just seemed like rude and obnoxious behaviour. Now that we know the “why,” we have been able to work on “how.” It is not rude or obnoxious. It is NEED. The thought is there, needing to be expressed, and, the way she describes it, it is painful not to get it out. It feels like she is exploding on the inside. The psychologist told us that it is classic Aspie behavior. As soon as the thought occurs, no matter how random, they have GOT to get it out. And, of course, having ADHD just adds to the need for urgency. Inside, they are going so fast in their heads that they are afraid they will forget if they don’t say it right away. In his observations of kids on the autism spectrum, he said it is something that is almost impossible to eleminate. They seem to get better with it over time, but told us not to make such a big deal about it. YET, we have siblings involved as well. My NT son hates always being put in second place. When he is talking first, I, too, force his sister to wait…not every time, but often. (Because we all know that it is a LOT faster to just let her say what she needs and get it over with.) But, when we make a point of it, for his sake, it is exactly as you describe. It is a labor-intensive process, but a labor of love for that sibling. As an “Aspie” with ADHD myself, I’ll tell ya – I never grew out of it! As an adult I often joke that I’m an incessant interrupter. With age I have learned to mostly quell the intermonster in conversation, but at least twice I will inadvertently interrupt during the conversation – so I guess “quell” isn’t all *that* accurate! :P. In any case, it IS hard to wait and take your turn. Often I’m sure I know what the other persons will respond so I don’t feel like waiting to hear what I’ve already guessed their answer to be in my head, again – from them. I also feel like what I have to say is very important and if we wait, it will very likely get lost in the jumble of other thoughts I have running around my head! Lol. So there you go – not all of us out grow it. Yeah, I felt like saying that to the psychologist. I don’t think any Aspie actually outgrows it. He probably, actually said, “It will get better with time, as she matures.” Eventually, even without someone formally teaching me, I figured out that it was rude to interrupt…but I still do it. It just sort of bursts out. But, my own mother is an Aspie, and I am either a bit Aspie myself (or I have a lot of learned traits. After all, we do what we see in our parents). We are all major talkers, interrupters, story-tellers, and cross-talkers. It all makes sense when you read all the Aspie books. But, it is still hard for an adult to accept a CHILD interrupting an adult conversation. My husband sees it as more than rude…it is disrespect. Yep, we had a major throw-down over that one. And, yeah, I won. Oh, and I just have to tell you that my youngest has that exact same bedding! 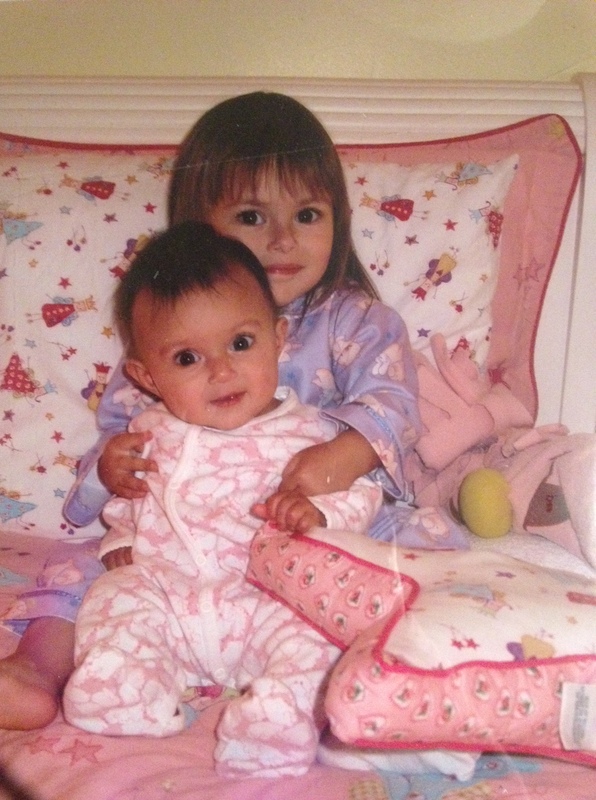 But, more importantly, those are some gorgeous little girls with incredible eyes…oh, those eyes!! What matters so much, too, is that Katie knew it was safe to express her frustrations and you not only listened, you honored her feelings by changing the behavior. Awesome parenting, my dear. Awesome. I think that’s great. It may have taken this long for Brooke to really have the skills to wait, and for you guys to know the difference between when she can and can’t….I think it will mean the world to Katie as Brooke gets the hang of waiting, and as you show that sometimes, she can come first, even if it takes more time. She knows how hard it must be to have her sister wait, she sees how much effort you’re putting into it…especially at her age, kids just want to feel heard, and you definitely achieved that for her. That was Beautiful. And, a great reminder to us all. Thank you. Even at 55, I sometimes still need my mom’s undivided attention. Yes, it does matter. This post brought tears to my eyes. When we’re all together it always seems as if the needs of my child with severe autism take precedent over the one who’s “mild”. I’m trying this approach today, thanks! Thank you so much for posting this! I really needed to hear this and be reminded that I need to pause for my NT daughter and REALLY listen! And… the tissues win again this early Australian morning! Thanks Jess. Once again, you’ve hit me right where I’m at. Today, I’ll be putting these words of wisdom into practice. I find it hard to balance the needs of the 20 y.o. along with the needs of the 8 y.o. But I love this because even though one may be more demanding, the other needs to know they are first sometimes. Looks like you did a great job of giving everyone what they needed. Wonderful! Love the “first/then”! Sam said something like this to our family therapist the other day. He told her that he feels like I will choose his brothers over him. And it stopped me and I realized that they are the squeaky wheels, but just because Sam is quieter, doesn’t mean he doesn’t need the grease sometimes too. It’s such a tough balance.